Our stock changes on a daily basis so come back to our site as often as possible for the latest items. 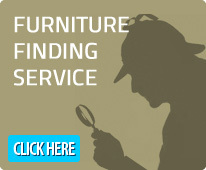 If you can’t find a specific item that you’re after on our website, than please email us with your requirements. If possible attach a photo and a makers or designers name. We have a extensive network of contacts we buy from worldwide, which we would use to find your specific item. For questions about items on our website please use the Product Question Button in the left sidebar and we will get back to you soon.